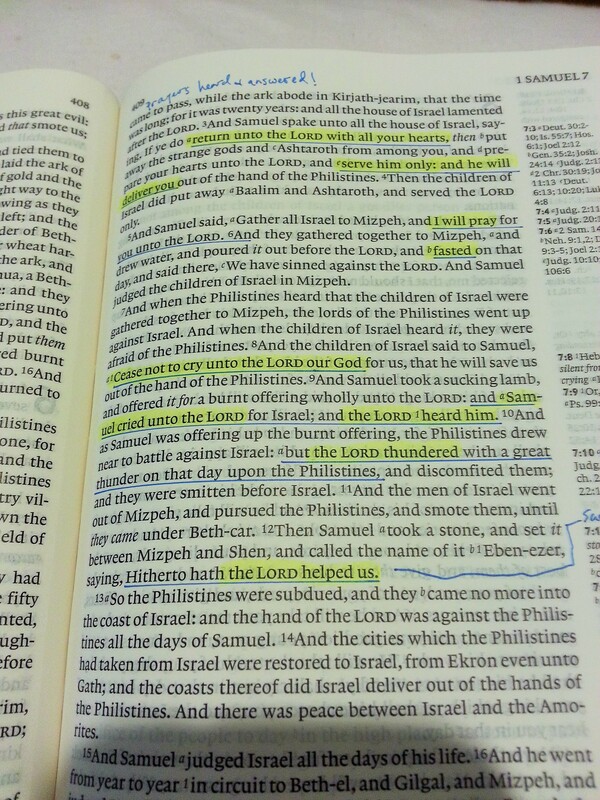 I’ve always been avid Bible marker but I haven’t had the courage to mark up my Cambridge Clarion. I was afraid of bleed-through. I’ve also had several readers ask about this, so I know I’m not the only one. Well, Christopher Lewis marked in his and I have to say that I’m impressed. 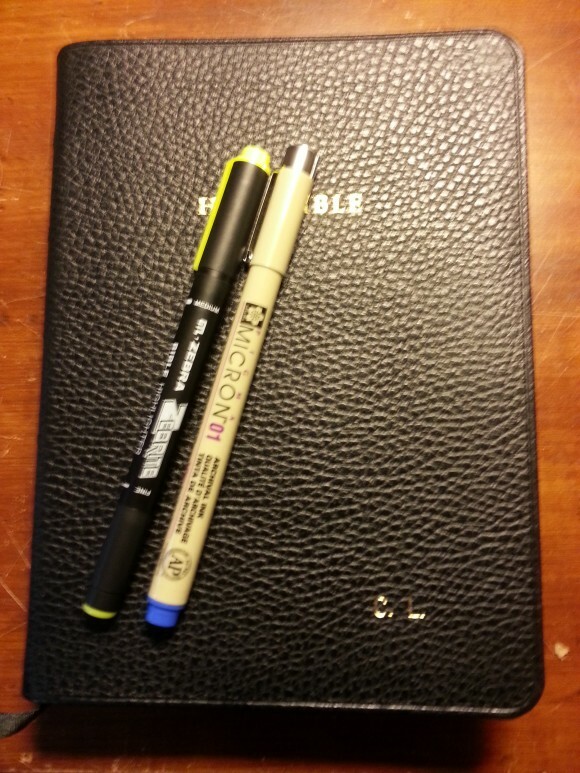 I use the Micron 01 and a Zebrite medium bible highlighter. The pen has no more bleed through than the type inside of the clarion. The highlighter does a great job. The paper in the Clarion is way better than most give it credit for. I have had some curling issues, but not enough to bother me. I wouldn’t recommend using anything other than bible pens or highlighters though, but with the proper pens, it really holds up well. I will also add that a little bleed through doesn’t bother me as long as it doesn’t interrupt the reading. 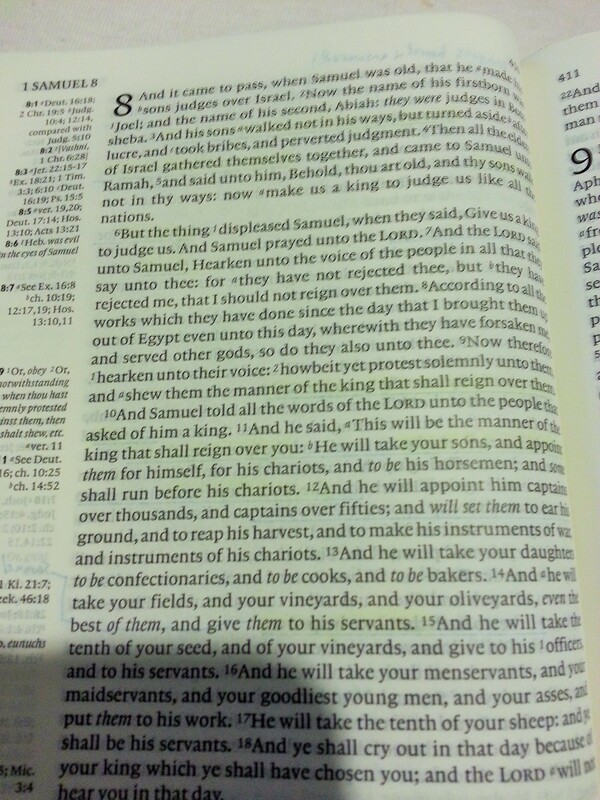 I use this bible also in Sunday School at church. I find that marking in it has helped me tremendously with finding passages that were tough to find originally because of the paragraph format. It has almost turned the Clarion into a scripture map. 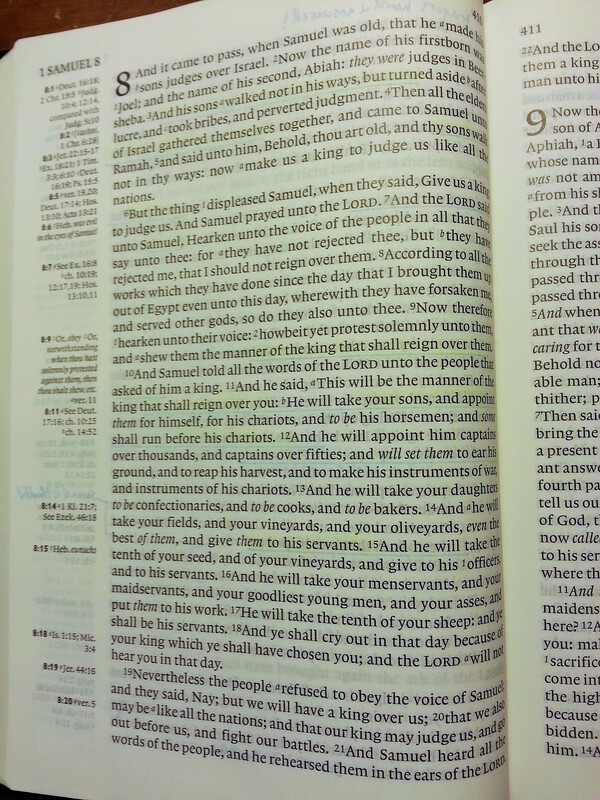 Click here to see my review of the Cambridge Clarion in KJV. Thanks for the post. 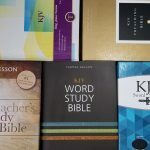 I hope this encourages others to actively write in their bibles. The Word is alive, an writing in it makes me an active part of it. I want to let you know that I very much appreciate your site Randy. Thanks Christopher. I appreciate you being a part of it. I am an avid bible note taker as well. I was wondering if you find room enough to take notes in your clarion? 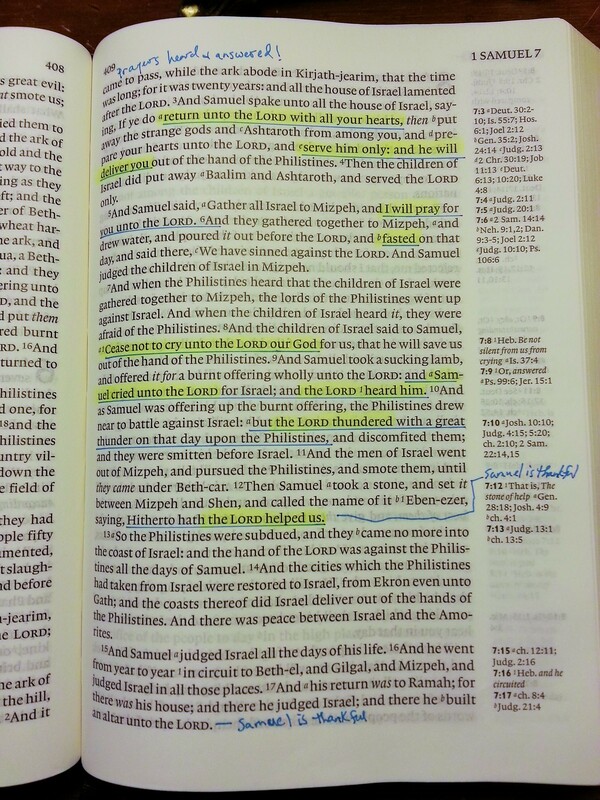 Specifically I have a fair amount of notes in Hebrews 10 do you find room enough in the margins to take notes there? Is there a way for you to connect me with Christopher? I am struggling with which binding option to purchase on the Clarion. He seems very happy with the calf split, but with the passing of time, I wanted to see how it is holding up. I really prefer black, but am hesitating spending the money on the goatskin. Calfskin is only brown. I am happy to provide my personal email if that is helpful. I’ll try to connect with him. I’ve used my calfsplit Concord and calfskin Clarion for several years. My Concord is starting to look worn where the Clarion still looks new. I think in the long run the calfskin will hold up better. Now I just need to decide whether my next one will be the goatskin or brown calf. I take care of 4 very young children so saving money is priority number one. So it may be a while. My daily reader is the brown calfskin. I like it because it’s easy to hold flat in one hand. The goatskin would be more floppy and harder to hold, but also softer and more elegant. It’s a tough choice. I advise not to get the goatskin version. So far it is the one purchase that I completely regret. The calf split with the paste down binding is the way to go for this small bible. It opens up better and lasts a long time. Mine is still in great shape. I will admit that I gave it to a friend, but he reads it everyday and I get to see it often. 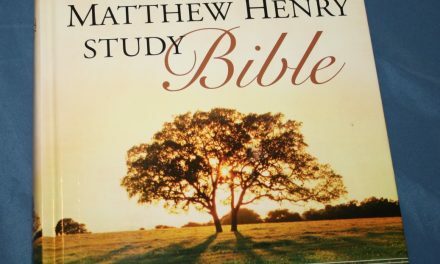 As far as doing a lot of notetaking, this is not thebible for that. There is room for notes but not for many notes. If thats the case, then it sounds like the calfskin is up my alley. I love the way the split calf sits in my hand. Everything about this bible is done right. Cambridge hit it out of the park with the Clarion. When the KJV Clarion first came out, I thought it wasn’t worth the paper it was printed on because of the distracting show-through. Now I’m wondering if Cambridge has changed the paper quality since then. Can anyone verify this? Is this trash denying Peter as the author of his two books really in the Clarion? Note, the asterisks for Catholic refers to another entry that says the term is used in NT letters that are addressed to the Church in general. I certainly don’t know, but everyone has a distinct writing style and the issue with the authorship over the various books of the Bible is not a new debate. I copied this short answer online, which might help clarify whatever statements might exist in the Clarion. “Based on his command of the Greek language and his familiarity with the Greek Septuagint (LXX), the author of 1 Peter may have been a Jew of the Hellenistic diaspora. On the other hand, Peter says in 5:12 “with the help of Silas, whom I regard as a faithful brother, I have written to you briefly”. Professional scribes such as Silas would have no trouble at all writing eloquent Greek. More people have challenged 2 Peter as “authentic” than any other book of the New Testament. None of the early Fathers definitely quoted 2 Peter and it was not even mentioned in the second century. 2 Peter has a different style of writing than 1 Peter, but the same literary style as Jude. Most of 2 Peter and Jude are parallel, and 15 of 25 verses in Jude actually appear in 2 Peter. So the author of 2 Peter is most probably not the same person as the author of 1 Peter, but may be the same as the author of Jude. Those who have read my comments about marking a bible know that I do not do this. Others find it helpful, and I agree it can be. The problem for me is that I had marked up textbooks, many of them high in value, a bible, again high in value, only to go back years later and wonder what was wrong with me that I would mark a text as I had. Even worse, the notes and markings were prejudicial to a fresh reading of the text. What I was left with was a bible with notes, basically a biblical notebook that I had outgrown. For these reasons I have repented of marking up anything but cheap paperbacks. I don’t hold any disrespect for those who mark their bibles, I only state that it doesn’t work for me any longer. 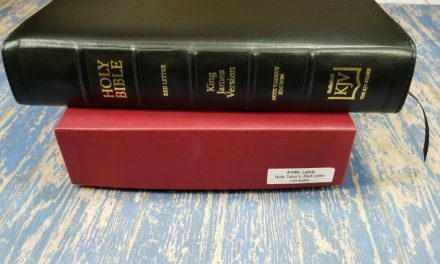 About the textual criticism resulting in questioning the authority of various books of the bible, I’m going to trust those who assembled the Holy Canon, they were closer to the sources and the history of the Word, and I am going to trust their judgement. Paul himself used a secretary for most of his writing, though at one juncture he commented about the large hand he used in writing it himself without a secretary. Paul obviously had trouble with his vision of some kind. Who is to know for a fact that his secretary did not modify his letters? This is highly unlikely, but is possible. If some one put together the writings and sayings of Peter to record his testimony, how is that materially different than what Paul was doing with a secretary? The answer is we from this distance can’t know. I will give my trust to those who assembled the Holy Canon, they were closer to the sources and had information that we can only guess at. The Lord would see that his word was preserved. Having faith in God is not a simple thing, it covers so many different situations. I will go with what we have and not worry about the details. Don, like most of you, I have a collection of bibles. There are some I will never mark in. I like to give them awaya to people when there is a need, so I like to pass them on with clean pages. But there are some I love to write in. The reason I want another Clarion is for the purpose of keeping it free from marks. Also, if I end up affording a Longprimer, I will never mark the text in it. I guess for me, it just depends on what bible it is. I will agree that I have looked back on some older bibles and wondered why I wrote certain things. 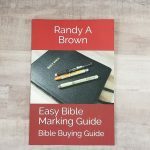 Please don’t let me discourage you from marking up your bible, if it works for you go ahead. I for my own reasons have repented of this practice, but if you find it valuable to you, by all means mark away. I shun bibles with included commentary for the same reason that I do not mark up my own. 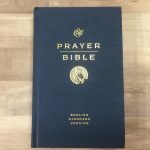 I use the best reference bible I can find, (The Westminister Reference Bible by TBS) and as much as possible let the scripture make its own commentary. I can’t say that I never use included notes and commentary, only that I believe it is prejudicial to a clean reading of the text. Your study habits are probably different than mine, so I say to you please yourself, keep reading your bible, and God Bless You. Do you find ample room in your clarion for writing? Or can you only write the minimum. For example I like to write small introductions to the books of the bible at the beginning or end of a book. Is this possible with the clarion? I do a lot of mission work in countries where iPhones and iPads cannot travel. I need a bible I can take notes in but still carry easily on flights. Usually a yellow highlighter shows through the least of any wet highlighter, but this paper is so thin that the moisture stretched and buckled the paper and it doesn’t shrink back when it dries. That was a wedge wide line. A thin point line was ok but nearly invisible! The sigma pens do shine through a bit and are so fine that the different colours are not easy to discriminate. I bought my clarion early 2015 on Amazon in UK at a knock down price. If the paper has improved lately this may be an old ‘second’ which Cambridge let go cheap. Hi Belinda. Thanks for sharing. I haven’t been brave enough to mark in mine. To my knowledge they haven’t changed the paper. It sounds like you got a good deal. I mark my Clarion using a black Micron 005. My experience is the same as the author’s although I don’t use a highlighter. It works very well for me.